Dyslexia is a common learning difficulty that mainly affects the way people read and spell words. Dyslexia is thought to be one of the most common learning difficulties. It's estimated that up to 1 in every 10 people in the UK has a certain degree of dyslexia. Dyslexia affects people of all ethnic backgrounds, and has even been shown to affect languages based on symbols rather than letters, such as Cantonese. However, a person’s native language can play an important role in the condition. For example, dyslexia is less problematic in languages with consistent rules around pronunciation, such as Italian and Spanish. Languages such as English, where there is often no clear connection between the written form and sound (for example, words such as "cough"and "dough"), can be more challenging for a person with dyslexia. The exact cause of dyslexia is unknown, but it's seen more commonly in families. Six genes have been identified that may be responsible for the condition, four of which affect the way the brain is formed during early life. Specialist brain scans (functional magnetic resonance imaging (MRI) scans) also show there is reduced function of one area towards the back of the brain, called the occipito-temporal cortex. These terms are explained in more detail below. Phonological awareness is thought to be a key skill in early reading and spelling development. It is the ability to identify how words are made up of smaller units of sound, known as phonemes. Changes in the sounds that make up words can lead to changes in their meaning. For example, a child with a good level of phonological awareness would understand that if you change the letter "p" in the word "pat" to "s", the word becomes "sat". Verbal memory is the ability to remember a sequence of verbal information for a short period of time. For example, the ability to remember a short list such as "red, blue, green", or a set of simple instructions, such as "Put on your gloves and your hat, find the lead for the dog and then go to the park." It can be difficult to diagnose dyslexia in young children as the signs are not always obvious. If you think your child has dyslexia, the first step is to speak to their teacher or the school’s special needs coordinator. Identifying your child’s strengths (such as picture puzzles or maths) as well as their difficulties can be helpful. Many schools identify children who are having difficulty learning in particular areas and offer additional support. If your child does not make progress when offered this support, the school may request a more in-depth assessment from either a specialist teacher or educational psychologist. It is also possible to request private assessments, either directly from an educational psychologist or through voluntary organisations such as Dyslexia Action. Adults who wish to be assessed for dyslexia can visit their local Dyslexia Action Centre. 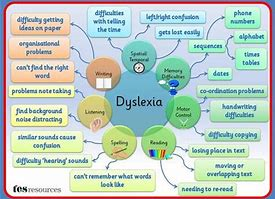 Although dyslexia is a lifelong problem, a range of educational programmes and interventions are often effective in improving reading and writing skills in many children with the condition. Research has shown that the earlier appropriate interventions are adopted, the better. Most children respond well to educational interventions and go on to make progress with reading and writing, although some children continue to find reading and writing difficult and will require more intensive support and long-term assistance to help them learn strategies for managing their difficulties. Children with dyslexia face challenges on a day-to-day basis, but even children who have severe dyslexia can go on to lead full and productive lives.